Uta Naruse (Riko Narumi) is a "unique" 13 year old child. She possessed the talent to read sheet music even before she could speak, but has now come to the point where she hates playing the piano. Her father was also a piano virtuoso, but mysteriously disappeared from her life at a young age. Jamshid Niyozov Sep 13 2015 1:04 am "Shindo" ("The pianist girl") is my favourite film. I will watch it again and again, but never going to miss. Bravo! Michael Thomas Feb 20 2014 4:46 pm Just saw this movie. Was excellent. Suzaku Oct 11 2009 9:42 pm Does anyone know that piano piece that was played when Kikuna does his piano audition. The piece that does a chromatic scale downward. maximus Apr 11 2008 12:39 pm The first hour or so of the movie was OK. Not very original but believable. However, I was in disbelieve with the ending and it spoiled the whole movie for me. The events that lead Uta to play Mozart’s piano concerto N.20 and how she plays it by heart, with no rehearsal, with an orchestra, just by “reading” it a few minutes before walking on stage… No way. This is pushing the “musical child prodigy” thing too far. Ki Apr 04 2008 4:38 pm Even if you have never watched a movie based on a (child) musical prodigy before, the basics of the movie you can probably gleam from intuition. As much rooted in the "Rocky" formula as anything else, the protagonist usually comes from a poor background, endures a rigorous training regiment, then takes center stage for their life altering grand performance. In a way "Shindo" does follow this formula, but in so many other ways "Shindo" departs markedly from that blue print. The movie features rising star Riko Narumi (How To Become Myself), who if you have never noticed before you will remember after this movie and there’s also Ken’ichi Matsuyama. Yes, the same candy loving, freak genius from the Death Note movies. Ken’ichi Matsuyama does show in "Shindo" that he can just as convincingly play an average Joe, just as convincingly as he can portray the odd over-the-top characters like he did in Death Note. One of the first things you notice about "Shindo" is the manner in which important details are left up in the air. Uta and Oto’s background are revealed bit by bit as the movie progresses, leaving the audience to initially guess why they act in the manner they do. The slight air of mystery behind their actions works well to separate "Shindo" from what you expect. Riko Naruse, even at her young age, takes over the screen whenever she appears onscreen. Even the casual shots of her sitting on a bus by herself as she looks quizzically out of the bus window takes on a life its own. There’s a tangible feeling during these moments that the camera seems to consume her image in the same manner as a thirsty flower consumes a radiant sunshine. Works well indeed. Beyond Riko Naruse, gorgeous camera shots abound in "Shindo" often featuring backgrounds that looks so lively you just want to jump into the screen. Any complaints with the movie would lie with the proverbial Japanese slowness of the film. The first 20 minutes definitely had a sprightly feel, with the precocious Uta and Oto acting out all of their idiosyncrasies. Those moments I found the most engaging. Then, with Uta’s background coming more into the foreground, the movie slows down a couple of notches and exhibits the Japanese calmness/slowness that’s found in a lot of other Japanese films. That’s not to say that "Shindo" slows down to a crawl, but at least compared to the first 20 minutes, that sprightly feel morphs into a more introspective feel which doesn’t disinterest, but just doesn’t interest in the same manner as the first 20 minutes. What there is to love with "Shindo" would surely begin with the appearance of two of Japan’s brightest young stars, Rika Naruse and Kenichi Matsuyama. Each gave charismatic performances that screamed out stars. The classical piano pieces that were featured in the movie were performed in a natural way and sounded just as engaging. While "Shindo" brings to the foreground classical music, unlike those classical musical pieces that is played in the film, the storyline in "Shindo" never hits the type of crescendo’s found in those musical pieces. 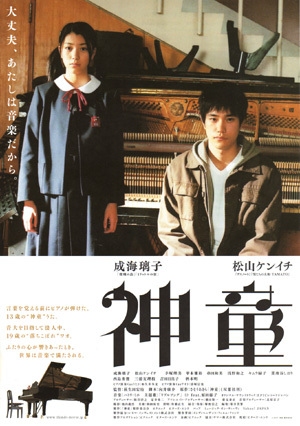 Sometimes in a film, like Sukida, that’s OK as the ambiance of the movie is everything, but with Shindo’s lively beginning and featuring such spunky two main characters, I did hope for higher highs to come cascading down the screen like those musical notes did. Even though that didn’t happen, there’s still a lot to like about Shindo.